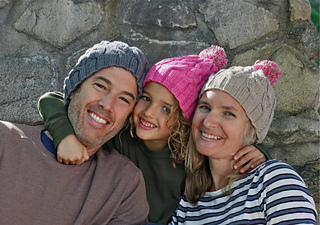 Cable Bunny is a fun, quick knit for the entire family. 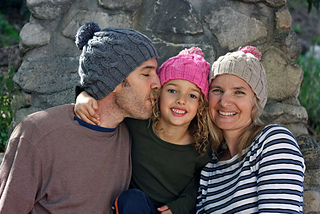 Sized to fit toddlers to grown men, there is a hat for everyone. 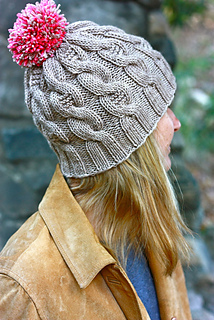 It is worked in a wonderful squishy aran weight yarn - Shalimar Yarns Enzo Aran - which comes in a huge array of fun colors. It is shown here in Ore, Aunt Pinky, and Toast Points. The cables are straightforward and easy to memorize. Instructions are both written and charted. The pattern has been professionally tech edited to reduce the possibility for error, but if you have questions or believe that you have found an error, please contact me. 12 3⁄4 (16, 19 1⁄4)” / 32.5 (40.5, 49) cm circumference. 6 (8, 8)” / 15 (20.5, 20.5) cm tall. Samples show child to average woman and large man sizes. 1 (1, 2) skeins Shalimar Yarns Enzo Aran in “Ore,” “Aunt Pinky” or “Toast Points” and 1 (1, 1) skein in a contrasting color for a bi-color pompom; 200 yds / 183 m per 3.5 oz / 100 g; 70% merino wool / 20% cashmere / 10% nylon. 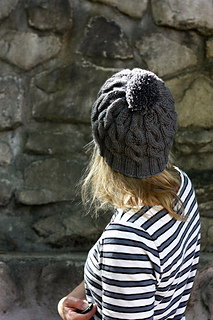 All sizes can be made with a single skein of the recommended yarn if you do not use a contrasting color for the pompom and re-use the yarn from the swatch, but the large man size will use every bit of yarn - purchase two skeins to be safe for that size. 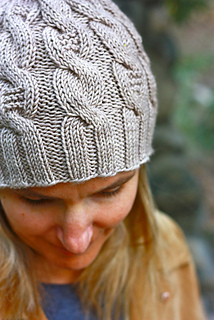 Hat requires approximately 170 (220, 260) yds / 155 (200, 238) m of aran weight yarn, including pompom. 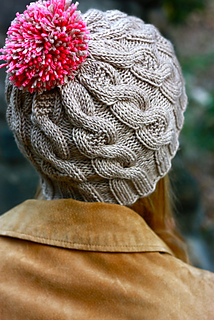 Pompom requires approximately 20 yds / 18 m of aran weight yarn. 31.5 sts, 28 rows equal 4” / 10 cm in Ribbing using US 5 (3.75 mm) needles, slightly stretched. 27.5 sts, 27 rows equal 4” / 10 cm in Interrupted Cable using US 7 (4.5 mm) needles, slightly stretched. The hat is worked in the round from the bottom up.